Anyone who seeking for job must prefer to work in the prestigious organisation, South Indian Bank is one of the institution which provides the space to explore your thoughts and abilities that makes yourself and the organisation to grow. SIB recently issued a recruitment notification to fill the vacant positions in the Probationary Clerk discipline of the Kolkata and Mizoram regions. Individuals who possess below mentioned eligibility and willing to apply for this vacancy can apply in prescribed format mentioned below. Candidates must be completed graduate in regular academic stream in 10, +2, +3 pattern from a recognized institution. Minimum of 55% marks is eligible for Science graduates and other 50% is eligible to apply. However, computer knowledge is essential for all applicants. Candidates who are applying for Probationary Clerk Job in SIB should not be more than 26 years of age as on 30th Nov, 2012. Age relaxation whichever applicable will be admissible as per rules. Applied candidates will be shortlisted and invited for Written exam. Based on the performance in written test, they will further undergo personal interview. Overall performance conforms the final selection. General category candidates are advised to pay Rs.250/- and Rs.50/- for ST/ST candidates. The application must be paid in the form of Crossed Demand Draft which should be drawn in favor of South Indian Bank, payable at Kolkata. Candidates who are willing to apply this clerk job in bank need to download the application form available from the official notification. Fill it with necessary details, affix photograph and attest signature wherever necessary. Send this application with required certificates and documents to the address "Dy General Manager, The South Indian Bank Ltd, Regional Office-Kolkata, Door No.20 A, Mother Theresa Sarani (Park Street), I st floor, Flat No.1, Kolkata-700016" on or before the last date. Don't forget to superscribe over the envelope as “Application for the post of Pro. Clerks” before posting. Indian Agricultural Research Institute is a national Instituted developed to encourage research and education in agriculture. IARI which is located in Pusa, New Delhi is funded and administrated by the Indian Council of Agricultural Research. It released a job notification to engage the deserving candidates in the vacant positions like Research Associate and Senior Research Fellow. These positions are being filled in the Zonal Technology Management and Business Planning and Development Unit of IARI project in New Delhi. Interested candidates who think they are eligible to this post can send their application by post and attend the Walk-In interview on the date mentioned below. For the manager post in IARI the applicant must possess a degree in science with 2 years MBA in Agri Business or Marketing from a reputed institution, with 5 years experience in relevant field. M.Sc or PhD in Science or Agriculture related discipline is eligible for Research Associate Vacancy. For research fellow position the candidate must be completed MCA, PGDCA, M.Sc or B.Tech in computer applications. And MBA or Post Graduate Diploma in Agri Business or Management with two years relevant field experience can also eligible to apply. The candidates who are applying for the Manager and RA post the age must lies between 40 to 45 years. For Senior Research Fellow vacancy the age limit is between 35 to 40 years. Age relaxation is applicable to candidates belongs to (SC, ST, OBC, Ex-serviceman and Women) as per department norms. Applications of the candidates will be shortlisted and invited for walk-in interview. Based on the performance in interview and previous experience the final selection takes place. The manager position gets a consolidated emolument of Rs.70000/- pm. The research associate position will be paid between Rs.23000 to Rs.24000/- which is based on their qualification and the SRF will get a pay of Rs.16000/- per month. All positions will be admitted with HRA allowance. The advance copy of the bio-data with photograph should reach the address by post "To Principal Investigator, ZTM & BPD Unit, IARI, New Delhi" or by email "zonaltech@gmail.com; zonaltech@iari.res.in" on or before 10th January, 2013. After that the eligible candidates may walk-in for interview with application form, self-attested photocopies of certificates and original certificate for reference, on the particular date mentioned for each post below. The walk-in interview venue is "Zonal Technology Management & Business Planning and Development (ZTM BPD) Unit, Near KAB –II, IARI, New Delhi-12". Union Public Service Commission is a central Government authorized agency which conducts civil services examination for various Government departments. This commission is headed by Chairman and other ten members. As of its role in conducting civil services examinations, it issued a recruitment notification for engaging eligible candidates in the National Defense Academy (NDA) and Naval Academy (NA) course which commencing from 2nd January 2014. Candidates who are aspiring to serve the nation by means of armed force jobs; this is the right time to grab your position. 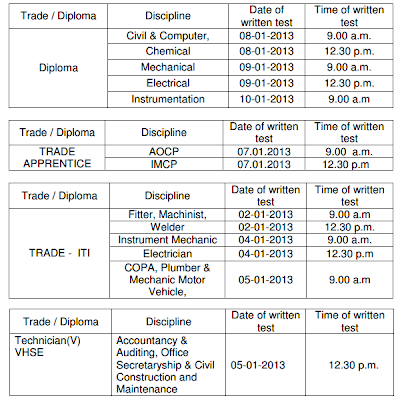 The eligibility, qualification and the date of exams are all mentioned below. Eligible aspirants who possess eligibility can apply online in the prescribed format. Any students who completed 12th or equivalent can apply for this NDA or NA Entrance Exam. Students who are appearing for the 12th exam in this academic year can also apply. This candidates can appear for SSB interview without certificates, if they are selected, they have to submit their original certificates to the respective authority before 5th Dec 2013. Candidates who are born between 2nd Jan 1995 to 1st July 1997 can apply for this recruitment exam in UPSC. However, age relaxation is applicable to reserved category candidates as per government norms. The selection process consists of several steps. At first the candidates have to attend the written exam, pass in written exam further qualify for Psychological Aptitude Test and Intelligence Test conducted by SSB. The final Selection will be based on the overall performance. Selected candidates will undergo a graduate course in B.SC or B.A in any discipline, from where the certificate is issued from Jawaharlal Nehru University, Delhi. After that these candidates will undergo two years training in Indian Military Academy, Dehradun. During the training period they will get a stipendiary pay of Rs.21000/- per month. After training they will be appointed as an Officer in Army at the respective rank with the pay band of Rs.15600-39100/- pm with Grade pay of Rs.5400/- pm, military pay of Rs.6000/- pm and other allowances as per military norms. Application fees of Rs.50/- has to be paid by General and OBC candidates at any SBI branch or by using net banking facility of SBI or its group banks. Sons of JCO/NCO/OR and SC/ST candidates are exempted from exam fees. Log on to the www.upsconline.nic.in website and click on the Part–I Online Application link. Fill the necessary details and submit the Part–I application. Then make a payment of Rs.50/- by means of the above said process and note the Challan or Reference number. After paying application fee, log on to the website and fill the Part–II Online Application with payment and other details. Upload the scanned color Photo and Signature at the places provided. Verify whether all the details are entered correctly and submit the application. After submission take a printout of this application for future reference. SSCNWR Technical Assistant Recruitment 2013 www.sscnwr.org! Staff Selection Commission North West Region which is headquartered at Chandigarh released recruitment notification fill vacant positions in the North West region of the country. Applications are invited from an aspirant who seeks bright future by developing their career prospectus. The notification represents various vacancies in four different departments. Candidates who are interested and possess the below mentioned eligibility criteria can apply on or before the last date of the notification expires. The detailed information about the vacancy and other details are stated below. Job Seekers whoever possess B.Sc or M.Sc degree in the above mentioned mentioned discipline with first class marks from a recognized institution or university is eligible to apply. Applicants applying for Assistant Plant Protection Officer in SSC must ne within the age of 30 years. For all other above mentioned Jobs in SSC North West Region, the candidate should be between 18 to 25 years of age. However, age relaxation will be applicable to candidates who belong to OBC and SC/ST category as per government norms. After scrutinizing of application the applicants will be invited for written test. Based on the performance in written test they will further undergo skill test and personal interview. Overall performance will be considered for the final selection. All above mentioned disciplines comes under the revised pay scale of Rs.9300 to 34800/- per month with the grade pay of Rs.4200/- Pm. Moreover, other allowances will be admissible as per departmental rules. Reserved category and women candidates are not necessary to pay application fee. Others need to pay Rs.50/- by means of Central Recruitment Fee Stamps which are available in all post offices. Fill the application form clearly as formatted in the official notification. Affix the color photograph and sign it wherever unnecessary. Send this application along with the attested certificates and fee payment receipt to the address "Deputy Regional Director (NWR), Staff Selection Commission, Block No. 3, Kendriya Sadan, Sector-9 Chandigarh-160017" on or before the last date. How to Apply Online For DMRC Assistant Manager Recruitment 2013! Delhi Metro Rail Corporation Limited is a state owned railway company that operates Metro Train services in the National Capital. It also involved in several future projects that are monorail and high speed rail projects within the state. Due to is establishing projects it requires huge number of man power. This makes DMRCL to issue a recruitment notification to engage engineering graduates in Assistant Manager discipline. Individuals who are eligible to satisfy the below mentioned criteria can apply in the prescribed format. Engineering graduates in relevant field who were qualified in the written exam of Indian Engineering Services conducted by UPSC during the years 2009 to 2011 is eligible. Moreover, any applicants who were attended any interviews with the above mentioned qualification and rejected or selected by UPSC and declined the offer by yourself can also apply for Assistant Manager Job in Delhi Metro Rail.. Candidates must be within the age of 28 years as on 1st July 2012. Age relaxation is admissible as 3 years for OBC and 5 years for SC/ST category candidates from the upper age limit. Selection process comprise three stages, the first stage is a test for writing skill which the applicant have to write on technical or general topic. In second stage the candidate will undergo Personal Interview and the final is Medical Examination. Based on the overall performance in the above process the final selection takes place. Employees will be offered with the pay scale of Rs.20600-46500/- per month. They will also admitted with other perks, DA, HRA, Insurance and allowances as per department rules. Candidates have to download the cash payment Challan available in the below link. Fill this Challan and pay Rs.250/- at any nearby State Bank of India branches in Account No 32091518042. For reserved category candidates they need to pay Rs.100/- only. However, both category candidates have to pay Rs.50/- as a bank charge along with their respective application fees. Log on to the DMRCL website www.delhimetrorail.com. Fill the online application with necessary details and take two printout copies of completed application. Affix a color photo in the application and sign it in the respective space. After registration they will get a registration slip and registration number. Send one copy of fee payment Challan, registration slip, application form and certificates whichever necessary to the address "The Director (HR), 3rd floor, Meeting Room Barakhamba Road, New Delhi" on or before the last date. Don't forget to super scribe over the envelope with name of post, post code and category (UR, OBC, SC/ST). 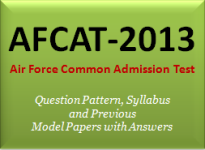 AFCAT Previous Sample Question Papers with Answers Online Test! Every year Indian Air Force conducts entrance exam to recruit deserving candidates to serve in all departments of Air Force. To make a clear idea about the exam and types of questions which are going to ask in the exam are explained in this post. The exam is conducted by means of objective type questions for hundred marks. The question pattern consists of four sections. Each section consists of 25 marks, candidates who where appearing for the exam will be provided with OMR coding sheet, you will be asked to code the right answers in the OMR sheet. In this post I have provided the sample questions in each section’s which were asked in previous years AFCAT Entrance Exam. Candidates can solve the objective type questions and verify the answers below. II. Verbal Ability in English: 3. He was charged ________ a whole Series of Crimes. 4. In the well water is only three meters from the_______. III. Numerical Ability: 7. The ratio of two numbers is 3:4 and their sum is 420. The greater of the two numbers is? 8.A fruit seller purchases apples at the rate of 3 for Rs.5 and sells them at 2 for 4 . what is his profit? 10.In a certain code language ‘CLOCK’ is written as ‘KCOLC’. How will ‘STEPS’ be written in that code? Arunachal Pradesh Police Sub Inspector Recruitment 2013! Arunachal Pradesh Police department is a youngest police services of the country comes under the ministry of Home Affairs of the state. It issued a recruitment notification to fill the vacant positions in the discipline of Sub Inspector. An individual who belongs to the Arunachal Pradesh state is eligible to apply. As stated in the notification the recruitment consists of 96 vacancies to engage in the civil service and telecommunication wing. Candidates who are interested to apply for this vacancy can apply in the prescribed format. For the Sub Inspector Position in Civil and IRBN, applying candidates must possess a bachelors degree secured from the recognized university and the Telecommunication vacancy possess Diploma in relevant field or physics, chemistry and maths degree from recognized Institution. Any individuals who attained 20 years can eligible up to a maximum of 25 years. The cutoff date for the age limit is 1st Jan 2013. Age relaxation is available for reserved category applicants as per Government Jobs. After scrutinizing applications the shortlisted candidates will be invited for Physical test, on successful completion of the physical test they further undergo written test followed by the Personal Interview. Based on the overall performance in the above process the final selection takes place. Selected candidates will be placed as a Sub Inspector in AP Police which pay according to the pay band Rs.9300-34800/- with the grade pay of Rs.4200/- per month. Moreover, other allowances are applicable as per rules. A treasury Challan of Rs.60/- has to be drawn in favor of "Asst Inspector General of Police(E), PHQ, Itanagar under head of Account’0055’ police". In case the applicant belongs to reserved category he/she has to pay only Rs.15/- as application fees. Download the application from the official website www.arunpol.gov.in and fill it with required details. Affix the passport size photo and make a signature on the back side of the application. Get all the attested photo copy of the certificate and send it in an envelope along with the fee payment Challan to the address "PHQ, Itanagar" on or before the last date. Karnataka Vikas Grameena KVG Bank Officer Recruitment 2012-2013! Karnataka Vikas Grameen Bank is a regional rural bank which serves over 530 branches that is sponsored by Syndicated bank. The regional bank is expanding its service to various rural towns which results in the opening of 50 new branches in the upcoming financial year. KVG invites online application from candidates who are secures a qualified scored in the previous IBPS exam conducted for RRB. Eligible aspirants who possess valid score in IBPS along with a bachelor’s degree can apply in the prescribed format of online application mentioned in the notification. Candidates who passed a recently held Regional Rural Bank IBPS exam with a valid score along with good academic score in any bachelor’s degree are eligible. However, the applicant must be Proficiency in local language and have computer knowledge. The age limit for the above mentioned vacancies are between 18 to 28 years as on 1st June 2012. Age relaxation will be admissible for reserved category candidates as per rules. KVG Bank quoted a minimum cutoff marks in IBPS. Any individuals who scored more or equal to the quoted cutoff marks can apply. These candidates will be shortlisted and invited for personal interview. Based on the interview and IBPS score the final selection takes place. The selected candidates will be placed in the Scale-I officer and in the Multipurpose Office Assistant vacancy with the total pay of Rs.26535/- and Rs.16640/- per month respectively. Download the fee payment Challan from the KVG bank website and pay Rs.100/- in any nearby Vikas Grameena Bank. Applicants who belongs to reserved category are requested to pay Rs.20/- only. Candidates have to file an online application. After paying the application fee the candidate will get the payment receipt, open the online link and fill the details in the receipt. Then go to the application link and fill the necessary details and take a print out of the application. Keep this application safe and produce it while appearing personal interview. ESIC Hospital Delhi Staff Nurse, Pharmacist Recruitment 2013! Employees State Insurance Corporation is an organization established to provide medical insurance for government employee of certain criteria. This organization serves the employees with fund raised from the employer and the employees in a particular ratio. ESIC Delhi issued recruitment notification to fill the vacant positions in the Group C Cadre of various paramedical disciplines. Online applications are invited from interested candidates who possess relevant qualification that satisfy the job requirement can apply in the preferred format. Candidate who is applying for Staff Nurse Vacancy in ESIC Delhi should hold a B.Sc (Nursing) or GNM qualification which must be registered in Indian Council of Nursing. Others should possess degree or diploma certificate course in relevant paramedical discipline above mentioned. Age Limit: The upper age limit for Staff Nurse is 37 years. Age for Nursing Orderly and Dresser posts lies between 18 to 27 years. For other vacancy the maximum age limit is 32 years. However, relaxation in age applicable for reserved category candidates as per central government norms. Performance in Written Exam is the only form of selection criteria for all posts stated above. Based on the marks scored in the written exam candidates will be placed in post which they applied for. Only the Staff Nurse Job and Occupational Therapist job lies under the pay band of Rs.9300-34800/- with the grade pay of Rs.4600/- per month. All other vacancies come under the pay band Rs.5200-20200/- with the grade pay ranges from Rs.1800-2400/- Pm. Other allowances are admissible as per department rules. Unreserved and OBC candidates have to pay an application fees of Rs.125/- in any Punjab National Bank Branch using the system generated Challan. Others no need to pay exam fees. Job seekers who are willing to apply log on to www.dmd-delhi.org website. Click the online registration link and fill the necessary details, upload the scanned copies of photo and signature, while the registration is over submit it and take a printout of the application and Challan. Get all the certificate photocopies attested from an gazetted officer and send certificate copies, application and fee payment Challan in an envelope to the address "Joint Director (Admn. ), Employees State Insurance Corporation, Directorate (Medical) Delhi, ESI Scheme: Dispensary Complex, Tilak Vihar, (Tilak Nagar), New Delhi-110018" by means of speed post or by registered post on or before the last date. Eastern Coal Fields www.easterncoal.gov.in Recruitment 2013! Eastern Coal Fields is a subsidiary of the Coal India Limited public sector company. It is one of the largest coal producing company of India. At present ECL owns more than 105 coal mines in various region of the eastern parts of the country. It invites applications for filling the job vacancies in Group C and B cadre at a basic pay of Rs.19035 per month. Interested candidates who possess the below stated eligibility can apply in the prescribed format as mentioned in the notification. Mining Sirdar: Matriculation with Sirdarship Certificate issued by DGMS or Diploma in Mining Engineering. Along with any one of the above, valid Gas Testing and First Aid Certificates are necessary. One year experience as a “Post Diploma Trainee” from Directorate of practical training in Mining is mandatory. Deputy Surveyor: Matriculate with valid Survey Certificate of Competency granted by DGMS. Compounder or Pharmacist: Matriculation with Diploma in Pharmacy from recognized Institute with two years practical training. X-Ray Tech or Radiographer: Diploma in radiography Technology with 3 years experience in recognized Institute/Govt. Hospital. Lab.Tech. (Med) or Technician or Pathological: Diploma in Pathological Technology/Pathological Technician with 3 years experience in recognized Hospital. Staff Nurse Vacancy: B.Sc(Nursing) or GNM from the Institute registered with all India Nursing Council. Minimum one year experience in 50 bedded and above hospital or Nursing home is necessary. Overseer (Civil): Three years Diploma in Civil Engineering. Stenographer: For Stenographer Job in ECL the eligibility is Matriculation or equivalent from any recognized Board. With shorthand speed of 80 words per minute and typing speed of 40 words per minute. Security Sub -Inspector: Graduate from a recognized Institution or University. EX-Army or Ex-BSF personnel or NCC B & C grade Certificate Holders Or Sportsman of all India Repute is eligible to apply. Age Limit: All vacancies except (Post No: 10) the age limit is between 18 to 30 years as on 1st December 2012. For the Security Sub Inspector post the age must be minimum 18 years and maximum 35 years. Age relaxations will be given to reserved category candidates as per rules. Selection Process: Selection of candidates undergoes several processes that consist of written test, trade test, skill test, physical test and personal interview. Final selection will be based on the specific test which is applicable for the particular post. Pay Scale: All the selected candidates will get a monthly salary of Rs.19035.02/- as per organizational norms. Application Fee: Fees exemption is available for reserved category candidates namely SC/ST and physical handicapped. Others have to pay Rs.200/- in the form of Demand Draft drawn favor of Eastern Coalfields Limited payable at State Bank of India, Sanctoria Branch. How to Apply: Applications can be submitted by two modes. Online Mode: Candidates have to log on to the www.easterncoal.gov.in website. Fill the online form with necessary documents and upload the scanned copy of passport size photo. Enter the valid Email ID while registration, don't change the Email ID until the recruitment process is over. After submitting download the copy of application and take a print out of it and send this in a envelope to "Manager(Recruitment), Eastern Coalfields Limited, Personnel Department ,HQ, AtSanctoria, po-Dishergarh , Dist-Burdwan,West Bengal, Pin-713333" on or before the last date. Offline Mode: Fill the application by yourself and affix the photograph over it and then sign it. Send this in an envelope to the above mentioned address. Note: Attach the attested photo copy all necessary certificate and documents along with the demand draft in the application form. ICAR ASRB Agriculture Recruitment Board Net Exam 2013 Syllabus! Agricultural Scientists Recruitment Board is an organization that conducts examination to recruit scientist in various agriculture discipline. It is administrated by Indian Council of Agricultural Research undertaken by ministry of agriculture. It conducts two exams to shortlist meritorious candidate’s, the exams namely preliminary exam followed by the mains. Overall performance in both exams and viva-voce is the criteria for final selection. Selected candidates will appointment as Scientists in ASR in the pay band three. Interested candidates who satisfy the below mentioned eligibility can apply in prescribed format instructed in the official notification. Education Qualification: Individuals who possess Masters degree (M.Sc, ME/M.Tech) in science related discipline that are relevant to the above mentioned vacancy from a recognized university can apply for the above posts related to your academic profile. Age Limit: Minimum age to apply for this vacancy is 21 years and the maximum of 32 years as on 1st August 2012. Reserved category candidates get benefit of age relaxation from the upper age limit. Selection Process: Final selection of candidates will be carried out based on the marks obtained in the ARS Preliminary, Main Exam and followed by Viva-voce. Pay Scale: Successful candidates in the examination will be appointed as Scientists in Agricultural Research Service of Indian Council of Agricultural Research in the pay band of Rs.15600 to 39100/- along with the grade pay of Rs.6000/-. Moreover they will be admitted with the allowances and other benefits available by the department. Application Fee: An examination fees of Rs.500/- has to pay for General and OBC candidates. Other reserved category candidates like (Woman/ SC/ ST/ PHC) need to pay only Rs.20/- as registration fees. The payments should be done through a Bank Draft which is drawn in favor of "Secretary, A.S.R.B. and payable at New Delhi". How to Apply: Application should be filled in the format as prescribed in the notification, affix the recent passport size photo along with the attested copies of necessary documents. Enclose all these documents and DD in an envelope with super scribing over it as “Application for ARS Examination-2012″. Preliminary Examination Centre__ Code No________ and ARS Examination Discipline________Code No_______". This envelop should be send by post or by person to the address "Secretary, Agricultural Scientists Recruitment Board, Krishi Anusandhan Bhavan, Pusa, New Delhi-110012" on or before the last date. 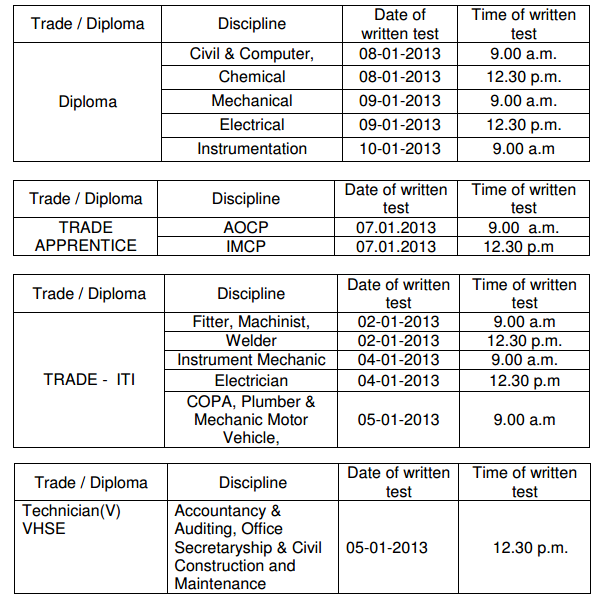 ARS Preliminary Examination - 24th February 2013 from 02.00 pm to 04.00 pm. ARS Main Examination – 23rd June 2013 from 10.00 am to 01.00 pm. BCPL Assistant Trainee Recruitment 2013 Bcplonline.co.in! Brahmaputra Cracker and Polymer Limited is a Petrochemical company which is the first to setup in North East India. BCPL is approved by Cabinet Committee on Economic Affairs and incorporated in the year 2006 as a Public Sector Enterprise to develop the economy in North East Region. It released recruitment notification to engage employees in the vacant positions. As per notification the company shows 93 vacant positions to be filled in various disciplines Foreman, Superintend, Technician and Others. Interested job seekers who carries the below mentioned eligibility can apply for this job. Candidates applying for foreman post must completed Diploma in engineering in relevant field and for Technician Trainee Vacancy the ITI or Diploma in relevant field. Other vacancy posses 10th and 12th as eligibility along with a certificate course that specializes the post which they are applying for. Stenographer Assistant Vacancy in Human Resource Should possess a Bachelor Degree with minimum 55% marks and minimum typing speed of 40 w.p.m in English (in computer) and minimum speed of 80 w.p.m. in Shorthand. For S5 grade vacancy the candidates must be within 32 years and 28 years for s3 grade. The Fire Operator position in S3 grade should not be more than 30 years and the Fireman Trainee Vacancy in S0 grade limits maximum of 25 years. The age limits should be as on 1st November 2012 and age relaxation is applicable as per government rules. Applicants need to pay an application fees of Rs.50/- by means of Demand Draft or Pay Order, that should be drawn in favor of "Brahmaputra Cracker and Polymer Limited payable at Dibrugarh, Assam". Candidates belongs to reserved category like SC, ST, PH are not necessary pay application fees. Selection of employee will be carried out based on the performances in the following tests which is relevant to the post which they applied. The final interview is common to all candidates who are short listed according to the marks scored in the test before the interview. Log on to the official website of BCPL www.bcplonline.co.in take a hard copy (Printout) of the application and fill it with necessary details. Affix a recent passport size photo, and then sign on it. Take photo copy of all documents and certificates get it attested from the gazetted officer. Send all these documents along with the Demand Draft in the envelope. Super scribe over the envelop as "Application for the post of _________." This envelope containing application should reach the address "Deputy General Manager (HR), Brahmaputra Cracker and Polymer Limited (BCPL), Main Fir Station Building, Project Site Office, PO-Lepetkata, Dibrugarh, Assam-786006" on or before the last date. Lady Hardinge Medical College Doctors Jobs in Delhi 2013! Lady Hardinge Medical College is a Medical College for women situated in New Delhi. It offers various training and teaching for medical students. The students who trained from LHMC then assigned to work in its two associated hospitals. LHMC released walk-in notification to recruit senior residents in various specialist disciplines. Interested doctors who possess post graduate degree in below mentioned discipline with required experience can apply for walk-in interview as advised below. Applicants who are interested to apply for Senior Resident Job in Delhi LHMC should possess MBBS degree with Post Graduate Diploma or Degree in relevant discipline. For dental resident doctor vacancy the candidate should hold a post graduate degree in dental (MDS). All educational qualifications must be obtained from the recognized university; the same must be registered with the Delhi Medical Council. The upper age limit for getting this job is 33 years as on the date of registration. Age relaxation is available as 5 years for SC, ST candidates and 3 years for OBC category candidates. Selection of candidates will be done on the basics of the performance in interview. Academic qualification and experience will be considered to shortlist candidates. Selected candidates will be placed as a Senior Resident Doctors in the discipline which they applied for. They will get a salary according to the pay scale of Rs.15600-39100/- with the grade pay of Rs.6600/- per month. Application forms can be obtained by paying Rs.500/- in the form of Demand Draft "payable to the Director, LHMC, New Delhi". Reserved category candidates (SC, ST) need to pay Rs.300/- only as application fees. Candidates have to walk-in for interview with the filled up application obtained from LHMC. Fill the application form with necessary details and affix a passport size photo on the right top corner of the application. Get a photocopy of all mandatory certificates and get it attested from a gazetted officer. Carry all the documents and walk-in for interview on the particular day which is mentioned for your specialty discipline. Candidates have to assemble on or before 9:30 am at the Convocation Hall of Lady Hardinge Medical College. The interview dates range from 6th December 2012 to 24th December 2012. Walk-in Interview Dates: Get from the official notification above.